For places outside of Russia with different transliteration of the Russian word, see Zalesje. Zalesye (Russian: Зале́сье, IPA: [zɐˈlʲesʲjə], lit. area beyond the forest) or Opolye (Russian: Опо́лье, IPA: [ɐˈpolʲjə], lit. area in the fields) is a historical region of Russia, comprising the north and west parts of Vladimir Oblast, the north-east of Moscow Oblast and the south of Yaroslavl Oblast. As the kernel of the medieval state of Vladimir-Suzdal, this area played a vital part in the development of Russian statehood. The name Zalesye alludes to the deep woods that used to separate the medieval Principality of Rostov from the Republic of Novgorod and from the Dnieper principalities. 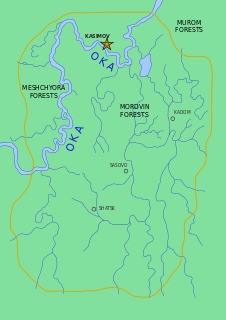 Before the coming of Slavs in the 9th century, Merians, Muroma, and other Finnic tribes inhabited the area. 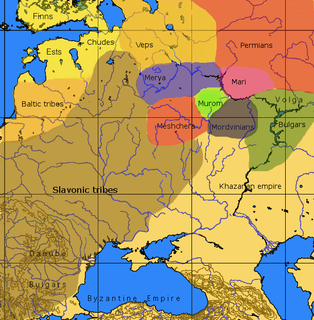 In the 10–12th centuries the Slavic settlers assimilated these tribes. In the twelfth century, this fertile area, being well protected from Turkic incursions by the forests, provided a favourable oasis for Slavic people migrating from the southern borders of Kievan Rus. The population of the area rapidly increased and by 1124 reached the point when Yuri Dolgoruki found it expedient to move his princely seat from Rostov in the Upper Volga Region to Suzdal in Zalesye. Suzdal was the oldest and most senior town of Opolye. Yuri established other important urban centres in Pereslavl-Zalessky (founded 1152), Yuriev-Polsky (1152), Dmitrov (1154), Starodub-on-the-Klyazma (1152), Vladimir-Zalessky (1108), Ksnyatin (1136), and Yaropolch-Zalessky (1136). The descriptors Zalessky ("beyond the woods") and Polsky ("in the fields") served to distinguish new cities from their eponymous towns in the south - now in modern-day Ukraine. Perpetually at odds with the powerful Suzdalian boyardom, Yuri even contemplated moving his capital from Suzdal to the new town of Pereslavl-Zalessky. His unexpected death (1157) forestalled this plan, but Yuri's son Andrew the Pious finally moved the princely seat to another young town, Vladimir, in 1157. The old nobility of Rostov and Suzdal, however, arranged Andrew's assassination (1174) and a brief civil war for supremacy in Zalesye followed. During the Mongol invasion of Russia (1223-1240), when the woods were gradually being cleared and new centres developed in Moscow, Tver, and elsewhere, the strategic importance of Zalesye declined. New urban centres developed around famous monasteries (e.g., Sergiev Posad, Kirzhach) or near royal residences (e.g., Alexandrov, Radonezh). Sometimes the term Zalesye can include the whole Upper Volga and Lower Klyazma region. In this sense, Zalesye equates to the territory included within the Golden Ring of Russia. The Golden Ring of Russia is a vast area in which old Russian cities are located in a ring-like arrangement and a well-known theme-route. The cities are located northeast of Moscow and were the north-eastern part of the ancient Rus'. The Golden Ring of Russia formerly comprised the region known as Zalesye. The idea of the route and the term were created in 1967 by Soviet historian and essayist Yuri Bychkov, who published in the newspaper Sovetskaya Kultura in November–December 1967 a series of essays on the cities under the heading "Golden Ring". Yaroslavl Oblast is a federal subject of Russia, which is located in the Central Federal District, surrounded by Tver, Moscow, Ivanovo, Vladimir, Kostroma, and Vologda Oblasts. This geographic location affords the oblast the advantages of proximity to Moscow and St. Petersburg. Additionally, the administrative center of the oblast—the city of Yaroslavl—is an intersection of major highways, railroads, and waterways. Population: 1,272,468. Vladimir Oblast is a federal subject of Russia. Its administrative center is the city of Vladimir, which is located 190 kilometers (120 mi) east of Moscow. As of the 2010 Census, the oblast's population was 1,443,693. Suzdal is a town and the administrative center of Suzdalsky District in Vladimir Oblast, Russia, located on the Kamenka River, 26 kilometers (16 mi) north of the city of Vladimir, the administrative center of the oblast. As of the 2010 Census, its population was 10,535. Yuri I Vladimirovich, known under his soubriquet Yuri Dolgorukiy, was a Rurikid prince and founder of the city of Moscow. He reigned as Velikiy Kniaz of Kiev from September 1149 to April 1151 and then again from March 1155 to May 1157. Yuri played a key role in the transition of political power from Kiev to Suzdal following the death of his elder brother Mstislav the Great in 1132. Andrei I Yuryevich, commonly known under his sobriquet Andrei the Pious, was Grand prince of Vladimir-Suzdal from 1157 till his death. His reign saw a complete decline of Kiev's rule over northeastern Rus, and the rise of Vladimir as the new capital city. Andrei was known in the West as Scythian Caesar, and is beatified as a saint in the Russian Orthodox Church. The Russian route M8, also known as the Kholmogory Highway or Yaroslavl highway, is a major trunk road that links Moscow to the Russian North in general and the sea harbour of Arkhangelsk in particular. The road runs north of Moscow across a distance of 1271 kilometres through Mytishchi, Pushkino, Sergiyev Posad, Pereslavl-Zalessky, Rostov the Great, Yaroslavl, Danilov, Gryazovets, Vologda, Kadnikov, Velsk, Kholmogory, and Arkhangelsk, ending up in the city of Severodvinsk. It passes Moscow, Vladimir, Yaroslavl, Vologda, and Arkhangelsk Oblasts.